Buffalo checks are also known as buffalo plaid and has its origin with the Scottish tartan clans. According to history, a descendant of the MacGregor clan would trade red and black checked blankets for buffalo pelts from the Indians. Woolrich made the first red and black buffalo plaid shirt in the 1850s and today, we see buffalo checks in a rainbow of colors in fabrics used throughout the home. 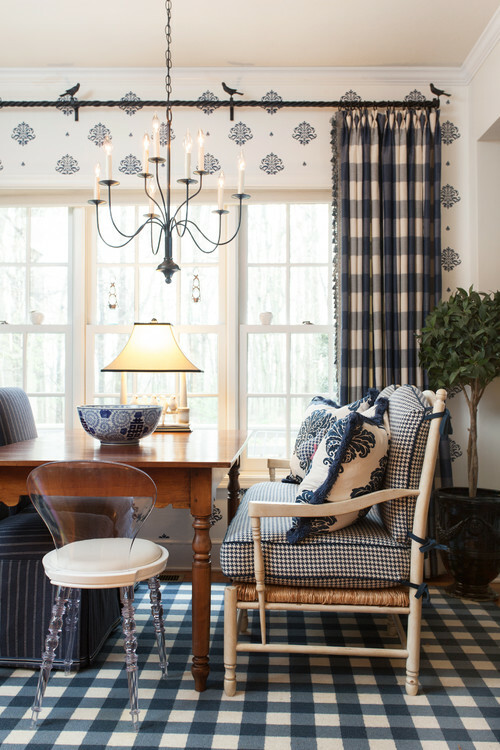 Navy and white buffalo checks are found in both the curtains and rug in this farmhouse dining room. The smaller check on the settee is gingham, another popular fabric choice in America. If you prefer a more subdued look, add buffalo checks in a soft neutral tone. This creates such a classic and pretty look. While you typically see buffalo checks on curtains, you can use the pattern anywhere, such as dining room chairs to add a little fun and pattern. This is a great option for those of you who feel the checks on full length curtains might be a little overpowering. Are you a fan of the bold and beautiful? Then this room is probably right up your alley! 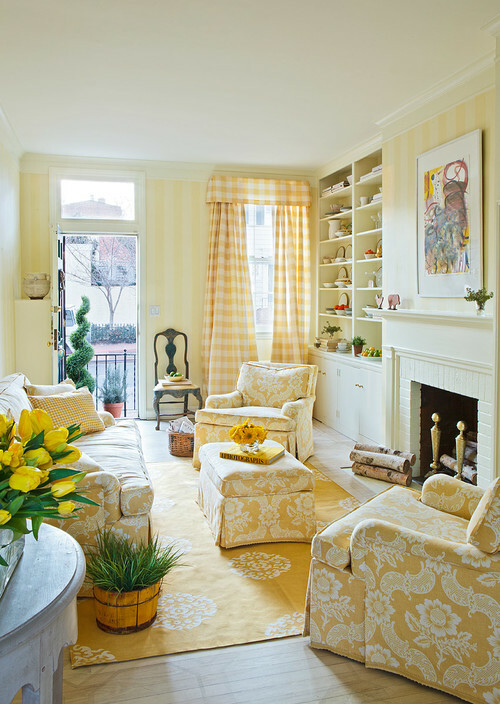 Yellow buffalo-checked curtains pair beautifully with striped wallpaper, patterned furniture and rugs. The yellow is a soft hue so everything blends beautifully. 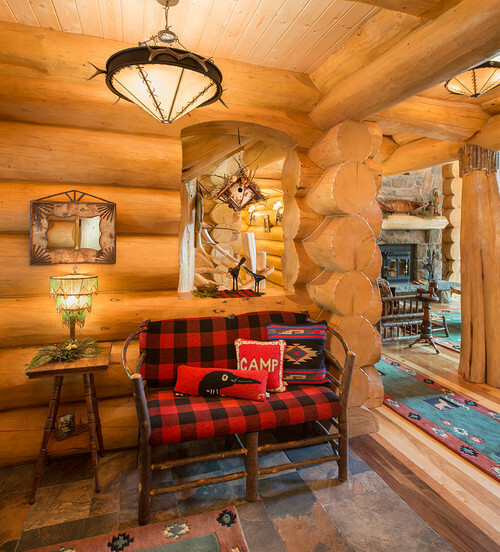 Classic red and black buffalo checks sit beautifully on a cozy bench in a log home foyer. You almost feel like Paul Bunyan could walk in the door any minute. And I love that loon pillow! Buffalo checks have a way of putting a smile on your face. Not too serious, they look great with a variety of patterns. This whimsical bedroom proves that mixing patterns can be fun. An over-sized pale buffalo check decorates the wall, while blue and cream checks frame the window. The windowpane quilt on the bed echoes the graphic pattern of buffalo plaid. Any time you want to add a bit of cheer to your room, reach for buffalo checks. Blue and yellow are classic Swedish colors, giving this room a Scandinavian vibe. Would you ever cover the walls of a small room with large buffalo checks? 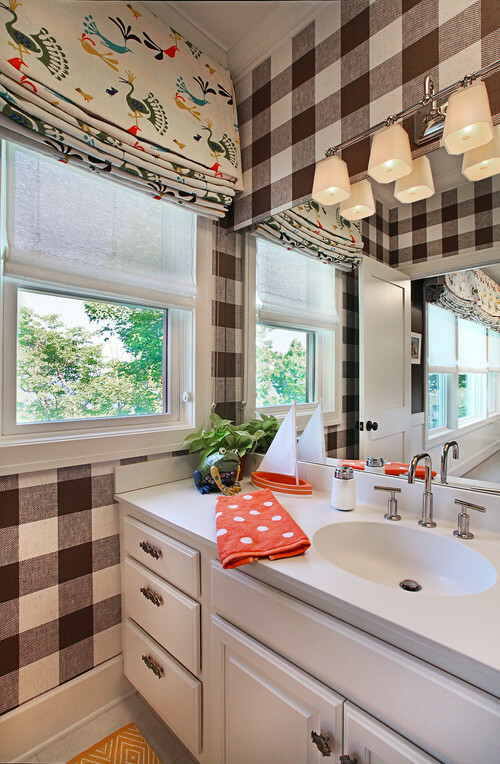 A fun, graphic pattern on the window shade balances the intensity of the checked wallpaper. A simple polka dot hand towel adds a shot of color to the space. Over-sized or small, buffalo checks add fun pattern and cheer to any room in the house. Go soft with a neutral color or go bold with strong colors and larger patterns. Which is your preference? Buffalo checks have long been a favorite of mine. In another lifetime, I worked for a small design studio and we used buffalo checks in all sizes in silk. It transcends rustic to casual to elegant. Wow! I love the idea of buffalo plaid in silk! Well, I think you know I’m in love with the yellow room. ???? The redecorating wheels are turning. Uh oh….. I love this classic look and am getting ready to reupholster our dining room chairs in buffalo check, I just can’t make my mind up about color because there just has to be color! Love your blog. Love the wallpaper in photo by Hann Builders. The neutral tones are beautiful and timeless. Would you have any idea what it is or where I could find out. Love your site. It’s always opened first! Oh i love checks too. Love the yellow it’s so elegant thank you. Just beautiful the buffalo checks. Each image is great. I’m thinking of using them on my kitchen chairs when I reupholster them. I too love buffalo checks! I moved a year ago this past June and brought my cream/gold buffalo kitchen panels with me. I reworked part of them and made café curtains for my kitchen and laundry room windows. I was soooooooooooo lucky the lady that purchased my house didn’t want them! 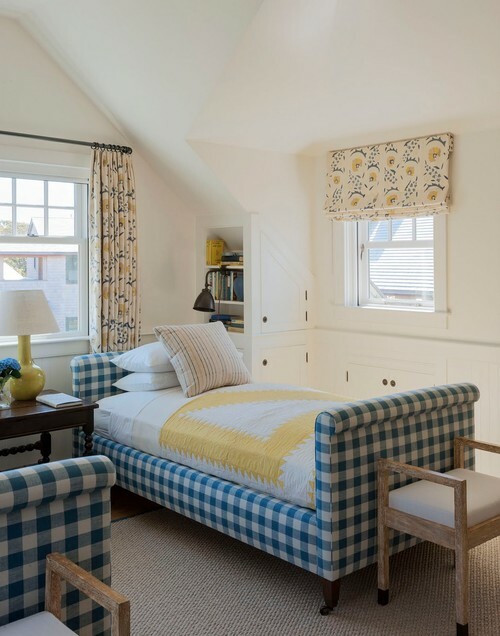 Love buffalo check….I remember so many years ago (the 70’s) I was in love with yellow and white buffalo check….had that pattern on my kitchen and on my kitchen table chair cushions…They have really come a long way in the beautiful ways they are used now! Great inspiration pics! Such beautiful rooms, all of them. I am really drawn to the buffalo checks and have been thinking of using it somewhere, somehow. Great inspiration pictures. Didn’t know that check was in……I just made a bed skirt, shams and a valance in navy and white large check. (The bedroom furniture is all white). My granddaughter is here visiting from NY and as she walked in the bedroom, she commented on loving the checks. She told me the room was in Vogue right now, as check is also in for clothes (she happens to be in Fashion). Wow, I scored and didn’t know it….smile. I bought my material at Walmart. Have any suggestions for making a shower curtain? I’m not a yellow lover but after seeing the yellow check…..I could change my mind. Do you think a navy and white stripe would be pretty? Any suggestions would be appreciated. Your site is great! Thanks a lot. I love checks and the room with the mixed checks and colorful block quilt is my favorite! Thank you, I am so tired of all white rooms, they are sometimes boring.